Charlotte based Headlines Barber Shop held its 3rdAnnual Cookout for a Cause on September 13 from 1-5pm at Reedy Creek Park. During the course of the event, the barber shop raised enough money to purchase 9,707 meals for Charlotte families in need. All proceeds from the event benefitted the Second Harvest Food Bank of Metrolina. 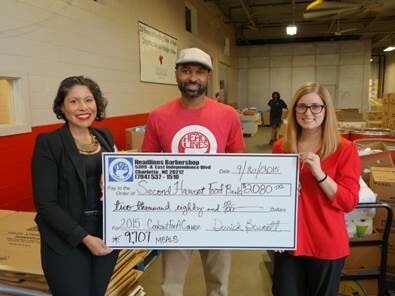 To date, Headlines Barber Shop has raised 38,000 pounds of food which equates to 26,000 meals for Charlotte families in need. This free event was open to the public. Money was raised three ways: through the sale of raffle tickets, through a silent auction and through donations. Some participants donated online as well. For additional information please visit www.headlinesbarbershop.com. Feel free to contact us at headlines08@gmail.com or 704-537-1510.